Socrates is a gritty and emotionally charged Brazilian indie by writer/director Alex Moratto. 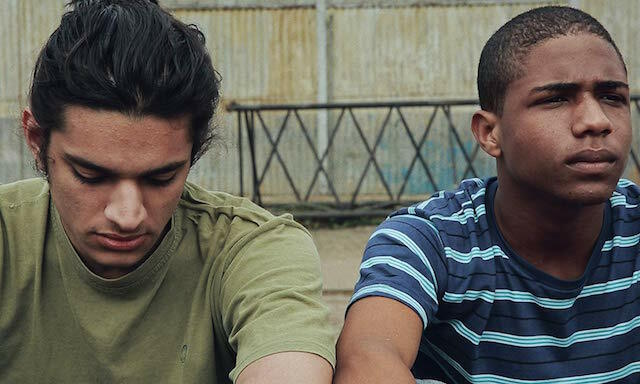 The plot centers on a a 15 year old boy, Christian Malheiros as Socrates, whose life is forever changed after his mother’s unexpected and inexplicable death in São Paulo’s ghetto of Baixada Santista. It’s a difficult story about a young man and his struggle to survive and find himself with little familial support in a rough and unforgiving environment as he fights to cut out an existence for himself. The trajectory of the film is one of a young man spinning out of control, looking for his identity, trying to find meaning in the bleak chaos that surrounds him. In this moment of desperation, Socrates will takes on any job he can find, while maintaining the facade of normalcy. He maintains a subterfuge with his mother’s employer, pretending that she is simply sick in an attempt to sustain housing and a means to eat. It’s a brittle experience that can not last. In order to find more income, he becomes involved with Maicon, played by Tales Ordakji. Here you begin to grasp the volatility and vulnerability of Socrates’ world. There are a number of unexpected turns in the story where Maicon and Socrates become very close as Socrates searches for intimacy and identity after his mother’s death. Their relationship is threatening, abusive and cruel, but it’s all that Socrates. You can feel Socrates’ anxiety, despair and inner conflict in seeking solutions to his weighty problems. Finally, a series of events set Socrates up for some really brutal moments and serious disappointments that his poverty and lack of education only exacerbates, sending him over the edge in a series of desperate acts that sink him to despair. This is not a kind movie for the viewer, and there is no easy resolution. There is little hope at the bottom, and there are no loving hands to make things right. This is Socrates. This entry was posted in Movies and tagged Billy Bennight, Brizilan, coming-of-age, Film Independent, IFC, Indie Film, Indie Movie, LA Film Festival, Movie Review. Bookmark the permalink.